Data Mining is the process of discovering interesting patterns and knowledge from data. In the last decades, a large number of data mining techniques have been proposed and applied to benchmark datasets containing a very limited number of instances. Nowadays, we have to cope with data mining problems characterized by a large number of instances and instances described by a large number of attributes. This demands for appropriate approaches and/or implementations. Further, in some real industrial applications, interpretability of the data mining models is crucial. 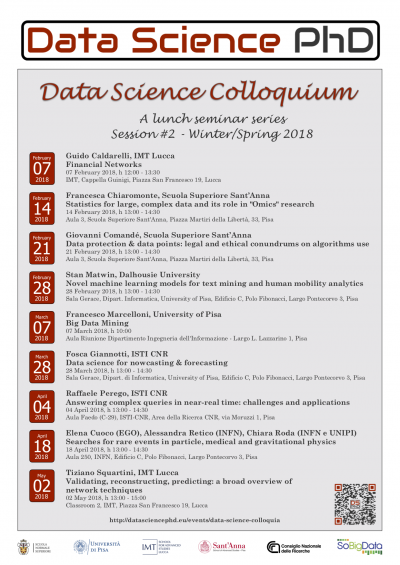 In the talk, we will introduce some approaches based on computational intelligence to classification and regression problems, characterised by a large amount of data. Further, we will point out how model interpretability can be enforced preserving high accuracy. Finally, we will discuss some applications.